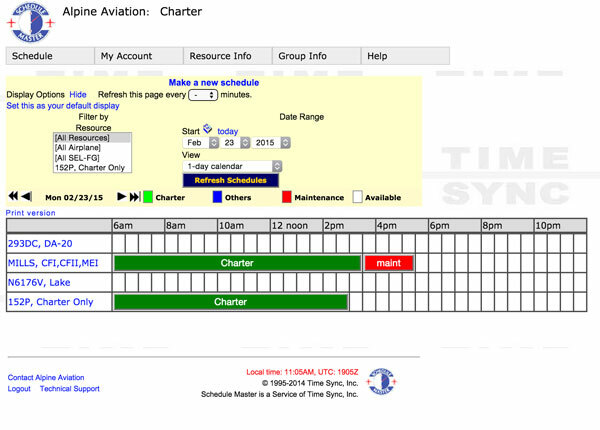 Alpine Aviation utilizes Schedulemaster.com for online flight scheduling, flight training and aircraft rental. When you come in for your introductory flight, we will set you up in Schedule Master so you can schedule your flights from the office, home or anywhere else. Schedule Master gives our customers the ability to check the status of both aircraft and instructors at anytime, day or night. This makes it easy to schedule all your flights based on your desired schedule. Not only is our rental fleet online, so is our maintenance. If an aircraft is unavailable, we update its status online so you always have the information you need. If there is a change to the schedule that affects one of your flights, you will receive an e-mail updating you of the change.